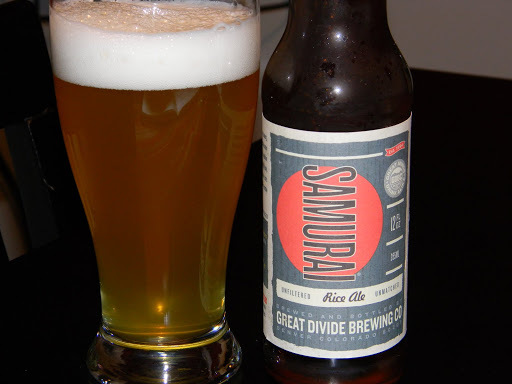 Review of Great Divide Samurai Ale | Beer Apprentice - Craft Beer News, Reviews, Interviews and Info. Today’s beer review is going to come from the Great Divide Brewing Company located in beautiful Denver, Colorado. It’s an American Blonde Ale called Samurai Ale. I really don’t know much about this brew. Actually, I had never even heard of it when I spotted it sitting on the shelf. Let’s turn to the website, greatdivide.com, to find out more about it. Samurai is an easy drinking, unfiltered ale that changes the status quo for unfiltered beers. The addition of rice gives Samurai a slightly fruity, crisp, refreshing and clean taste. This is definitely not your everyday unfiltered beer. Let’s give it a try, what do ya say? The Samurai has an ABV of 5.1% and comes in a 12 oz. bottle. The color was a light, hazy yellow with brighter yellow highlights around the bottom of the glass. The head that was produced was bright white and soapy with a mixture of both large and small bubbles. It was of very nice size and had better than average retention and lacing. It didn’t look bad, really. The aroma was chocked full of bread and biscuit malts. A citrusy note of both lemon and orange played an important role in the bouquet along with a slightly spicy note. The bread and biscuit malts trumped the fruitiness here as they helped build a sturdy and solid nose. A grain hint came through at the very end to give a tad more complexity. The taste brought out a lemon citrus zest along with a bit of the rice that was mentioned in the description. Slightly toasted bread and wheat touches came through in the middle, which coincided with small splashes of bitterness. Not much spice was detected in the taste, however I did find that it had a minute salty flavor. Hmm. The flavor seemed to be balanced rather well, however it was just a bit weak and reserved. The mouthfeel was medium to thin, smooth, crisp, refreshing, thirst quenching and somewhat dry. Leaves a nice showing of flavor on the palate. Not too much, but just enough to savor the taste. This brew isn’t bad at all. I would be able to down several of these after doing some yard work during the Summer. It may be a little tame in the flavor and aroma departments, but that makes it very easily drinkable and refreshing. I was a little skeptical when I saw that rice was a primary ingredient, however it did nothing to conjure similarities to a “macro.” Give it a try if you are looking for a decent alternative in a Summer refresher. It’s not overdone with spices like a lot of other American Blonde Ales are. It’s definitely more malt”y” and I prefer that. Well, anyway, give it a go if you see it. Thanks a bunch guys. I really appreciate all the support.